Androgen receptor antagonists are compounds that block androgen receptors and antagonize the effect of androgens such as testosterone. 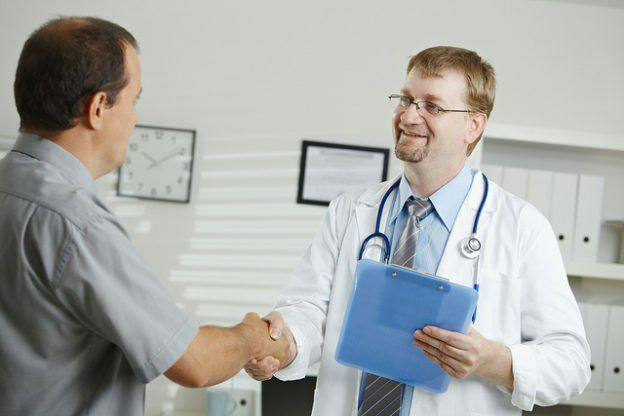 Several conditions such as hirsutism, acne, and prostate cancer are known to be dependent on androgens and antiandrogens can help alleviate the symptoms of this condition or even improve the outcome in patients with metastatic prostate cancer. Why Do We Need Other Treatments? Androgen receptor antagonists work by blocking androgen receptors, hence, diminishing the effects of androgens on the target tissue, for instance, a prostate tumor. These antiandrogens resemble naturally occurring androgens such as testosterone structurally, but have an opposite effect, in that they block the receptor. The role of androgens in the pathophysiology of different conditions such as prostate cancer, acne, hirsutism, or infertility in polycystic ovary syndrome is well understood. Androgen diminishing techniques such as castration and the administration of high dosage estrogen were used in the 1950s to improve the prognosis of patients with metastatic prostate cancer. Additionally, patients with metastatic prostate cancer, with the progression of the tumor after castration, showed a response to docetaxel, prolonging their life by decades. These findings led to the realization that antiandrogens might play an important role in changing the outcome of prostate cancer. Our current understanding of the role of androgens in the normal prostate allows us to anticipate how important it is to modulate androgen receptors in prostate disease, including prostate cancer. The binding of androgen to androgen receptors in normal prostate cells activates the pathways responsible for cellular differentiation, rather than proliferation. However, in patients with prostate cancer, the androgen binding to its receptors results in the activation of proliferation pathways rather than differentiation, hence making the tumor more aggressive and more likely to metastasize. Therefore, blocking this cascade by either, castration, or by inhibiting androgen receptors, may have a positive effect on the prognosis of patients with advanced and metastatic prostate cancer. One of the easiest ways to diminish the effects of androgen is to simply diminish production of androgen. Surgical or chemical castration is one form of anti-androgen therapy since the testicles are rendered unable to produce androgens, either chemically or due to surgical removal. The administration of leuprolide can achieve chemical castration. Leuprolide is a luteinizing hormone-releasing hormone (LHRH) analog that works on LHRH receptors in the hypothalamus and down-regulates them. Down-regulating LHRH receptors in the hypothalamus are thought to adversely affect the hypothalamic-pituitary axis and eventually results in a reduction of testosterone production. In the treatment of prostate cancer, approximately three years after castration, the adrenal glands take over and start producing androgens. 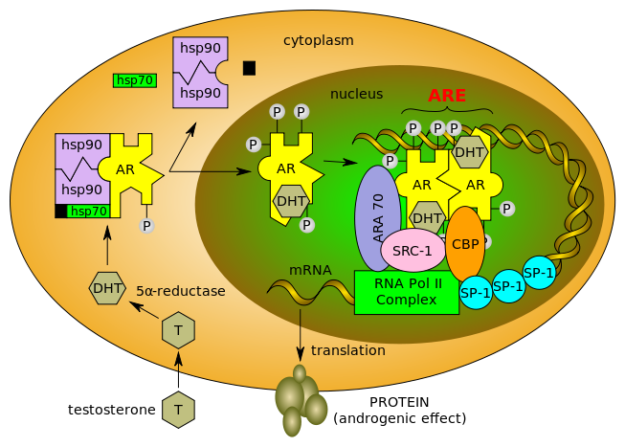 Therefore, the disease may progress, unless intracellular synthesis of androgens is inhibited. Ketoconazole, an antifungal drug, has one side effect that might be helpful in patients with castration-resistant, advanced prostate cancer: it can inhibit androgen synthesis in the adrenal glands. 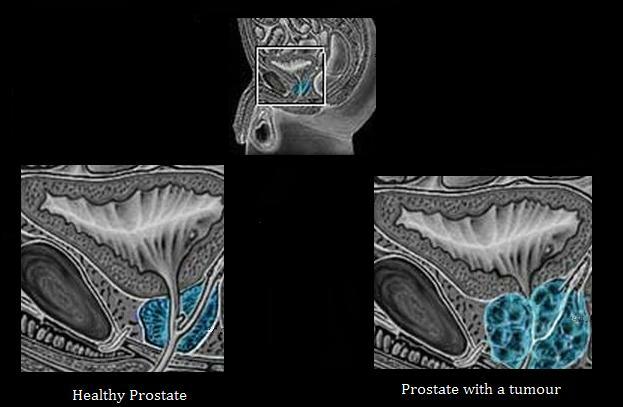 More recently, abiraterone has been approved for the treatment of castration-resistant prostate cancer. Abiraterone works by inhibiting androgen synthesis, like ketoconazole, but it is safer, more potent, and more selective to the adrenal glands. Unfortunately, many patients with metastatic prostate cancer are castration-resistant and continue to have disease progression despite treatment with ketoconazole or abiraterone. Therefore, other mechanisms of blocking androgen effects on the cancerous prostate cells are needed. The first antiandrogens used in practice were steroidal in structure. Unfortunately, these antiandrogens had low efficacy, were hepatotoxic and had several other side effects such as decreased libido and increased risk for cardiovascular disease. The next group of drugs used were nonsteroidal anti-androgens. As we have previously explained, androgen binds to its receptors thus activating cellular proliferation instead of differentiation in cancerous cells. This happens due to two important factors. The first is that androgen will bind to its receptors on the cellular surface by binding to the ligand-binding pocket. Once this happens, a coactivator-binding platform is formed (AF1), which recruits other coactivators, which eventually form an active transcriptional complex. This complex reads several androgen-regulated genes that are thought to play an important role in inducing cellular proliferation. Therefore, blocking the AF1 coactivator from recruiting other coactivators can play a key role in antagonizing the effects of androgens. The antiandrogen bicalutamide (bic), acts by binding to the ligand-binding pocket at the androgen receptor and forming an inactive coactivator that cannot recruit other coactivators, hence make it impossible to form the active transcription complex. In fact, binding of bic to the ligand-binding pocket results in the formation of a factor that recruits co-repressors, further antagonizing the normal androgenic effects of inducing DNA transcription. Bic has been studied in different randomized clinical trials, where they found it to be effective in altering the prognosis of advanced prostate cancer as first-line therapy. Therefore, the American Society of Clinical Oncology currently recommends the use of bic monotherapy as an alternative to castration. Another anti-androgen approved for use in 2009, is enzalutamide. Enzalutamide is superior to bic, because it not only inhibits the formation of an active AF1, but it also inhibits the translocation and binding of the coactivator binding platform to its nuclear target. This mechanism of action is responsible for the near-complete blockade of DNA transcription of androgen-regulated genes that can be achieved with enzalutamide. Enzalutamide and bic are both nonsteroidal antiandrogens and are currently approved only in metastatic prostate cancer that is castration- and chemotherapy-resistant. While enzalutamide is currently approved for use in chemotherapy-resistant cases of advanced prostatic cancer, a recent clinical trial showed the efficacy of enzalutamide in patients with advanced prostate cancer even prior to chemotherapy. This clinical trial showed the clear efficacy of enzalutamide to the extent that it became unethical to continue with the clinical trial and the placebo group was switched to enzalutamide.